The juvenile/immature is probably browner overall. Bill and legs are duller and the eyes are dark. The chicks have black down with greenish gloss. The bill is black with pale tip and base. The eyes are brownish. There is a small blackish wing-claw. The Sakalava Rail is known from three separated areas in the lowland of W Madagascar, at Antsalova, near Maintirano, and in the regions of Lakes Masama and Bemamba. The Sakalava Rail is usually found along streams and marshes with stretches of open water and patches of vegetation including water-lilies, aquatic ferns, sedges and grasses where it forages. But it also needs a dense cover of reedbeds with reed, bulrushes and sedges for shelter. The Sakalava Rail gives repeated “kwook” if threatened or disturbed. This sound is very similar to the noise of two sticks being knocked together. The usual calls “tic-tic” or “tic-tic-tic huaww” are given while the bird flicks its tail upwards. The contact call between mates is a phrase repeated at intervals of 4-6 seconds “truwurururururururu” given by motionless birds. The chicks produce loud “kiouw” repeated every 3-5 seconds. The contact call between adults and juveniles is a clicking “teck”. The Sakalava Rail feeds on invertebrates caught from water surface and aquatic plants while walking on top of the floating vegetation. The diet is poorly known, but it probably includes spiders, aquatic insects and crustaceans. The Sakalava Rail is monogamous and territorial. It is usually seen alone or in pairs. The breeding territory is usually marked by increasing calling. Pair formation and courtship behaviour are unknown and little studied, but courtship displays are generally simple. Both mates build the nest among the dense floating vegetation. The Sakalava Rail is apparently sedentary on the island. With the short, broad, rounded wings, the rail only performs short-distance flights, usually low and weak and with dangling legs. Brief flights may occur when the bird is disturbed. The breeding season appears to be very wide with almost nine months, from July to March, with peak between September and November. From on observation at Lake Amparihy in November 2006, the nest was described as a structure placed in a deep tunnel of Phragmites reeds, about 70 cm above water level. But usually, the nest is built on clump or on floating vegetation, between 70 and 100 cm above water. Both adults collect nest material within 30-40 metres from the nest. They often use dead Phragmites leaves and dry Salvinia hastata leaves (aquatic ferns). The female lays 2-4 creamy-white eggs with brown markings. The incubation is shared by both adults and lasts 12-14 days. The young leave the nest about 2-3 days after hatching. They are fed and reared by both parents. Adults and young are vulnerable to predation by Black rat, Madagascar Coucal and Black Kite, and the reproductive success is low. The Sakalava Rail has small, very fragmented population. It is threatened by habitat loss following degradation and destruction of wetlands for rice cultivation, by the impact of introduced fish on aquatic vegetation, by burning of marshland areas by farmers in the dry season, and by predation. The population may not exceed 250 individuals, but other surveys likely indicate larger population roughly estimated to number 350/1,500 individuals. This population is declining owing to wetland destruction. 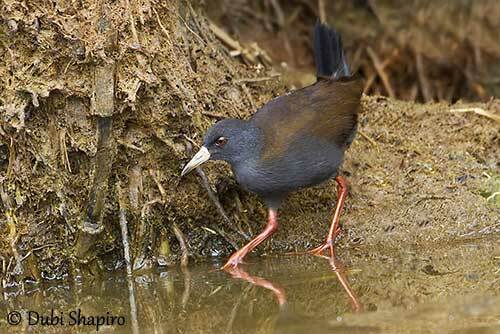 The Sakalava Rail is currently listed as Endangered. The Sakalava Rail is endemic to Madagascar. It was discovered in 1929 and it is rarely seen. It frequents marshes, streams and lakes with tall, dense vegetation. It is usually found in gaps between reeds and other aquatic plants where it forages for invertebrates. It nests near water in marshy areas. The species is found in three separated sites in the western lowland of Madagascar. The Sakalava Rail is threatened by habitat loss through conversion of wetlands for rice cultivation. It is affected by numerous changes in its wet habitats involving decline of the small population. It is currently listed as Endangered. The Sakalava Rail has dark slate-grey head, neck and underparts, with olive-brown wash on crown, nape and flanks. On the upperparts, mantle to rump, and scapulars, upperwing-coverts and tertials are dark brown with chestnut wash, creating a strong contrast with the head. The uppertail-coverts are blackish-grey with dark brown tinge, whereas the tail is black. On the upperwings, greater and median coverts are dark brown with slightly paler edges. Alula, primary and secondary flight-feathers are very dark brown with chestnut tinge on outer edges. On the underwings, the axillaries are dark brown or dark grey-brown like the underwing-coverts. Chin and throat are dark grey. Lower belly and thighs to vent are sometimes washed olive-brown. The undertail-coverts are blackish-grey. The bill is greenish-yellow. The eyes are red, surrounded by pinkish to pale red eyering. Legs and feet are pinkish-red. Male and female are similar, although the female is slightly browner than male and with paler legs. Probably an immature with dark eyes and duller bill and legs.